Right-click a versioned item in the Projects window and choose Subversion>Update. Right-click a listed file in the Versioning window and choose Update. To update all source files, click the 'Update All' icon in the toolbar located on top of both the Versioning window and Diff Viewer. 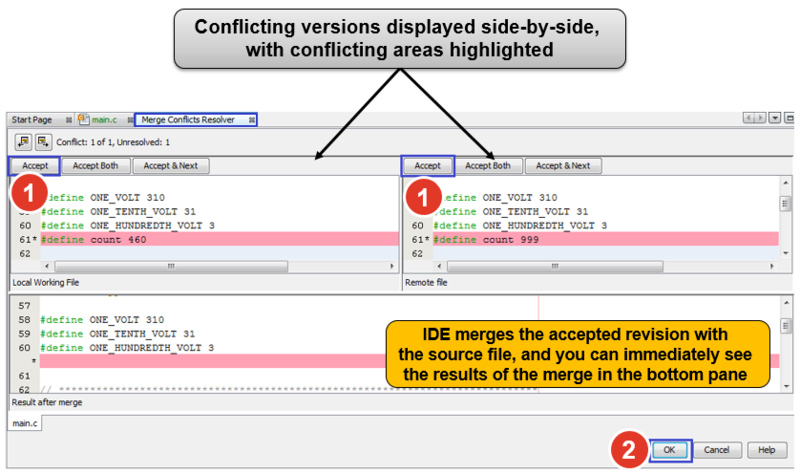 MPLAB X IDE provides an intuitive Merge Conflicts Resolver to resolve conflicts. Right-click on the file that has the conflict and choose 'Resolve Conflicts' or Subversion>Resolve Conflicts. For every conflict, click the Accept button of the revision you want to accept. Once all conflicts are resolved, click OK to exit the Merge Conflicts Resolver and save the modified file. From the Projects, Files or Favorites window, right-click new or modified items and choose Subversion>Commit. From the Versioning window or Diff Viewer, click the Commit All button located in the toolbar. Type in a commit message, describing the change being committed, in the Commit Message text area. After specifying actions for individual files, click Commit.